My son loves hand knitted wool socks. Everyone in my family does, but my boy especially loves them and wears them constantly in winter. Luckily, my LYS always has oddballs of sturdy, self-patterning sock yarns like Regia in its sale bin, so for about 5 bucks and one week's worth of effort, I can whip up a pair of warm socks for my favorite 6 year old. These socks see some really hard wear; my son has been known to wear them outside on the driveway, and keeps the same three or four in constant rotation, and they have yet to wear out. There's nary a hole in socks that are on their third winter. This year, though, my mind is on other children, the street children of Nepal. I'm still really stuck on that image of homeless children wearing flip flops in the winter. In our comfortable western world, the closest we get to this experience walking to the car after a pedicure in January. My son will surely get his socks, but he'll have to wait. He has a drawer full, sometimes to overflowing, of hand knit and commercially made socks. He has sturdy shoes and footie pajamas, a warm bed and a full belly every night. So right now, I'm making socks for kids in Nepal. I made these two pairs, and started a third this week. use the sturdiest yarn you have. I used Regia and Lang Jawoll (I even knit the heels and toes using that cute spool of reinforcement thread that comes with the Jawoll), but Opal, Trekking XXL, Lion Brand Sock Ease or Patons Kroy would also be good choices, and I'm sure I'm forgetting others in this wool/nylon blend category. Assume that these socks will see constant, hard wear, will rarely be rotated, and almost never washed. Knit at a tight gauge to ensure sturdiness. I knit my socks at 8 spi. You could also knit a bigger yarn at a tighter gauge. If you have some really sturdy wooly worsted, for example, you could knit it at 6spi and get a really firm pair of socks. One 50g ball of yarn was enough for a pair of child's socks, but just enough for adequate cuffs (about 5"). Make the cuffs as long as possible. I happen to have several 50g oddballs saved up for my boy's socks, but if I had more yardage, I'd make the cuffs longer. This is a great time for you to stash-bust your balls of leftover yarns and make your own stripey or wild-self patterning socks. I used used my Ann Budd's Knitters Handy Book of Patterns as my guide for stitch count and lengths, but there is any number of generic sock patterns out there for children. Skip the lacy patterns, and crank out simple stockinette or ribbed socks. This is why the self-patterning yarns are ideal. Thanks so much for your enthusiasm for this project, and whatever you knit, whether it is socks, a hat, mittens or anything else will be appreciated. I know I have been absent from blog-land lately, and I am not even certain if Ann, Mo, and I have any readers out there anymore. But I am returning with a request for help, and a call to action. Knitters are generous people, I know. We knit chemo caps for people with cancer, blankets for animal shelters, and prayer shawls for the grieving. We knit for soldiers and veterans, foster children and homeless children. Our sturdy, warm handknits get shipped to all corners of the world where people are cold: Afghanistan, Mongolia, Botswana. While I hate to take away from any of these other worthy recipients of our generosity, it has been brought to my attention, knitters, that people are also cold in Nepal. 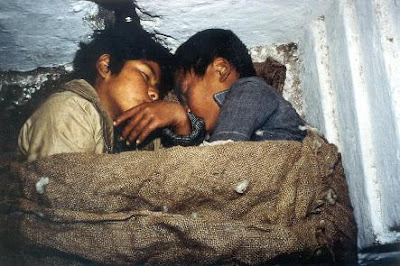 I recently received an e-mail from a friend who is involved with an organization called ROKPA which provides services to the homeless and impoverished in Nepal. He shared with me that "many of the homeless people (or even about half) are children who live on the streets or in shanties. During the winter months they are subject to very cold weather and are happy to have something to put on their heads, hands, feet, necks, bodies. The kids need everything from socks (they walk around in flip flops) to wooly hats." Did you catch that? Homeless kids in Nepal wear flip flops in the winter. 1. Warm, insulating natural fibers only. Knit for durability, warmth, and of course, beauty. 2. Knit items for kids between the ages of 4-10, whatever size that means to you. 3. The deadline is January 25th. 4. Contact me at lizjosh1ATverizonDOTnet for mailing information. I am serving as the collection point for this project, and would love to stuff Chris's luggage with socks, hats, scarves, sweaters, shawls, and mittens for the people of Nepal. I know your needles are busy, but if you could spare some time, some stash, and some love for this project, I would so appreciate it. Also, feel free to link on your blog or your favorite corner of Ravelry to help get the word out. I'll be posting here a little more frequently with ideas and patterns, and hopefully, to share photos of whatever knits I receive.